Nice location, but the place is bad. My good advice is: Avoid!! !this pub. 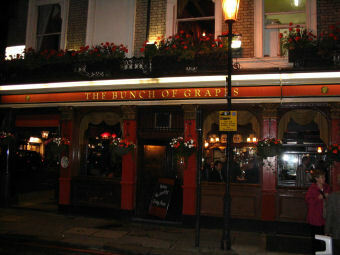 It could be so nice little pub, but its managed soooo badly. The old Landlady is very unprofessional, she forgot how to run a pub and make it attractive a long time ago. My boyfriend worked there a short period, they were always short of staff, ordering often messed up, cockroaches and mice running everywhere in the kitchen and even upstairs in the small dining room. He said the change of the management is really needed there. So, rating this pub: 1 out of 10, just because of the nice location. I must say that the previous recent comments pretty much have this hostelry sized; its Victorianised interior appears at least to be reasonably authentic, and suits the style of the building and layout. The pub is certainly commodious and can easily accommodate larger numbers, even though I didn't feel too conspicuous as a single drinker on my recent brief drop-in following a thoroughly consuming 3 hours at the V & A. It is somewhere that blatantly markets itself as one of London's innumerable "traditional" pubs that serves real ale and decent grub, and observational evidence from my experience suggested that this works, although with the result that there is a sense of impermanency in the clientele and I imagine it would be a tall order to become known as a "regular" here, if indeed one had such modest ambitions. The ale is indeed Greene King and whilst they are a commercially widespread brand that rarely sets beer enthusiasts' palates ablaze, in fairness the beer I drank at the BOG was impeccably kept; indeed some of the best GK I've had of late, so well done on that. Food looked to be in good order, with hefty portions being dished up around me, but not being in need of solids I didn't partake myself so can say no more. On balance a perfectly reasonable pub in which to take a quick pint, and certainly one that rises above many of its peers which plough a similar furrow. However, not somewhere one should necessarily seek out. If you've a dry mouth following the air-conditioned hermetic experiences of the museum or Harrods, it may do the job; otherwise, there's plenty more fish in the sea which conjure up a more lasting and authentic atmopshere and charisma. Given its location, its surprising that this type of old-fashioned (in the best sense) pub has survived without being gastro-ified. Rather splendid Victorian interior with snob screens and open door partitions around the island bar, engraved mirrors and some interesting art deco light fittings. The layout means that some of the furniture is a bit cramped but there is a separate dining room upstairs. Four real ales on from the Greene King stable - IPA (a decent pint at �3.10), Royal London, Abbot and OSH. For those of you that missed the report on TV regarding the activities of the kitchen staff behind closed doors should take heed and avoid this pub like the plague. The staff were secretely filmed skidding across the kitchen floor on frozen burger patties which were later served up to the unsuspecting clients. Should have been closed long time ago!! !